Interbike 2012 has come and gone and we’ve braved Las Vegas once again to take a look at new trends in racks and bags in the bike industry. While this year seems less revolutionary than last, with most products only getting a new color scheme or incorporating some of last years innovations, there were a few things that caught our eye. For those that want to see things in action, watch our video roundup below. 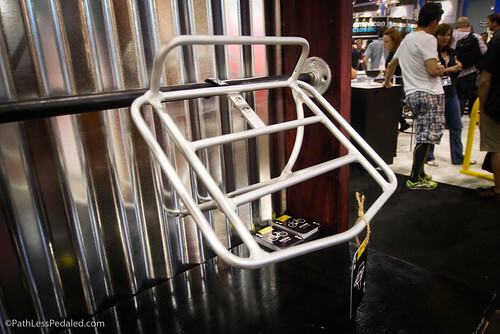 Perhaps the rack that jumped out the most for us was a rack for Specialized’s Globe bikes. It is a sort of mini-porteur rack. Much smaller than the current VO and SOMA offerings, but larger than a rando rack. It fits in the nice middle. 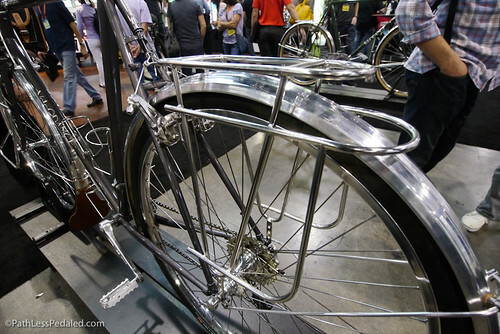 Because of its size its considerably lighter than a lot of the porteur style racks out there. It would make a great platform for strapping down a tent, sleeping bag or other gear in a stuff sacks. It would also work well with some Po Campo bags in urban mode. In the video, it’s shown mounting on the inside stays of a Globe bike, but we were reassured that it would work on any bike with mid-fork eyelets. 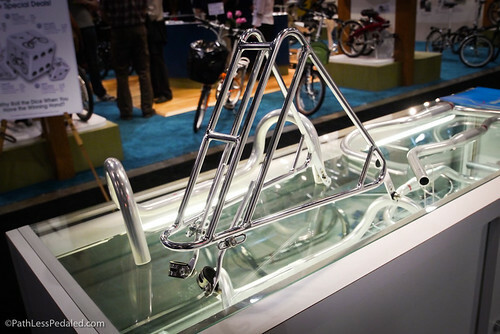 Other racks that caught our eye was a shiny Nitto rack that was very minimal looking but two tiered. Velo-Orange had on display their new rear and front racks decked out on their Campeur bike. The rear rack is two tiered and is shown attached to canti studs but also includes stays to mount to bike eyelets. The front has fixed front pannier mounts and a built in decaleur. It was a little more interesting in the bag front this year. 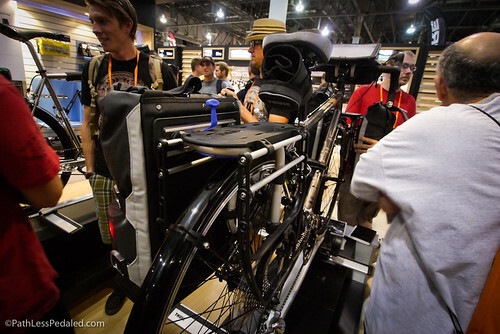 The big standout was Thule’s new panniers and bags. Built around the New Zeland designed Freeloader racks, the panniers incorporate some innovative designs that we haven’t seen on bags before. 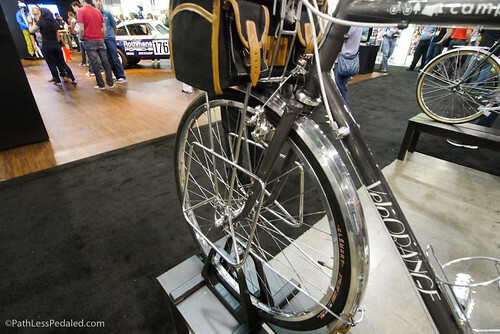 Kudos to them for thinking outside the box and bringing something new to the sometimes dull world of panniers. They have a disappearing Bat Cave like flipping hardware (watch the vid to see it in action); instead of a third pannier hook or bungee, they use a powerful rare earth magnet as the third mounting point AND (for the bike commuting Freddies of the world) their panniers have a rear light pocket! Perhaps I’m overly excited by the light pocket, but its a nice touch that accomplishes a few things 1) keeps your blinky from getting stolen 2) gives your blinky a nice visible and stable mounting point making up for any of its mounting short comings (for example the Vis 180 – great light, crappy mount). Axiom was showing off their Grand Tour series which is all about modularity. 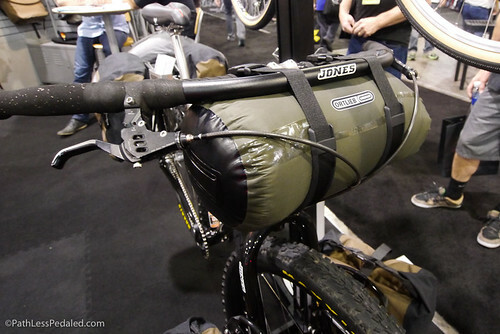 The rear panniers come with removable and replaceable pouches and several compression points for mounting gear. They’ve added a tent bag to the line as well as a (rather large) toiletry bag. The idea is that when you get to camp the first things you do when you arrive is pitch your tent and take a shower. Their modular system allows you to accomplish these things without getting into the main bag compartments. 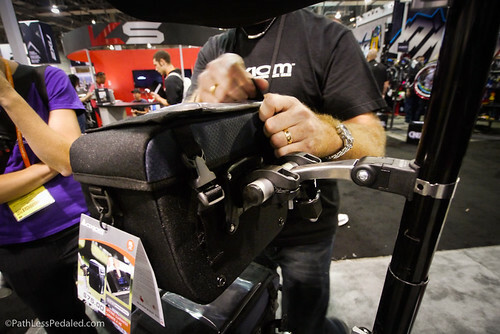 Also exciting from Axiom are handlebar bags that don’t use “smash a wire” technology. It uses a handlebar clamp that allows you to adjust the fulcrum. I’m pretty excited about this and hope to try one out in the future. 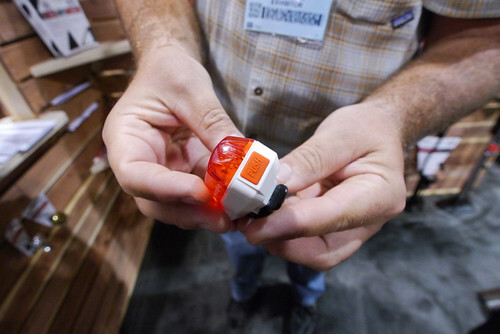 Ortlieb freshened up some hardware in their urban line with some magnet closures that can be operated with one hand. The thinking is that when you do groceries one arm will be otherwise occupied with carrying your stuff. 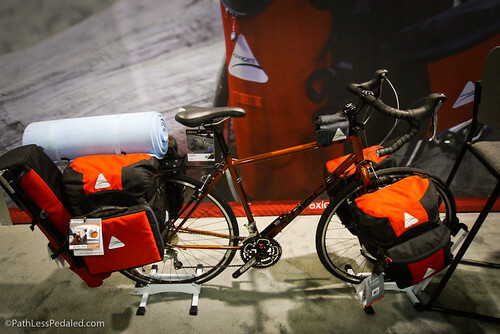 Notably in the Ortlieb booth was a bikepacking bike with a drybag tied to the handlebars. Although they have no plans to really get into bikepacking, they wanted to demonstrate that their dry bags can be used for that purpose. 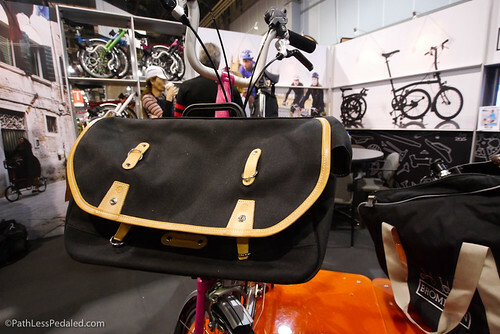 Another notable bag sight was at the Brompton booth. A stylish canvas and leather bag by Philosophy bags was on display. Speaking of Brompton, their toolkit was again on display and will be shipping out within a few weeks. Another new accessory was a water bottle mount that used magnets (magnets are the new titanium!). 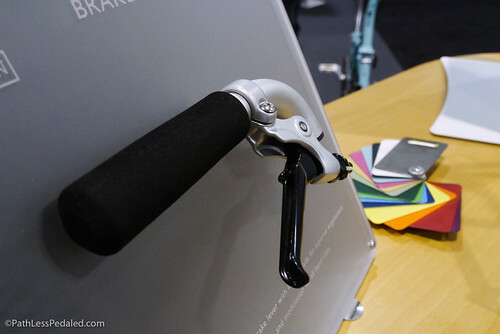 The biggest update to Brompton was the brake levers. Gone are the cheesy looking levers of old and they are now replaced with levers that are more modern looking and with a supposedly strong lever return for a more positive feeling. 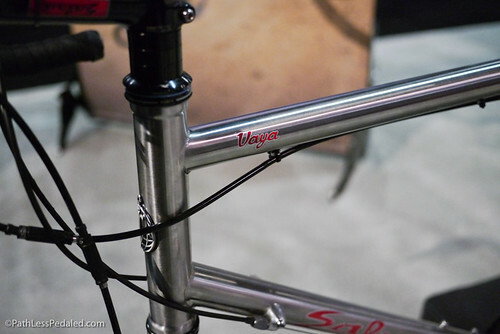 In terms of bikes, the big standouts for us was a chance to see the Travel Vaya in person. The stainless steel is just stunning to see in person! 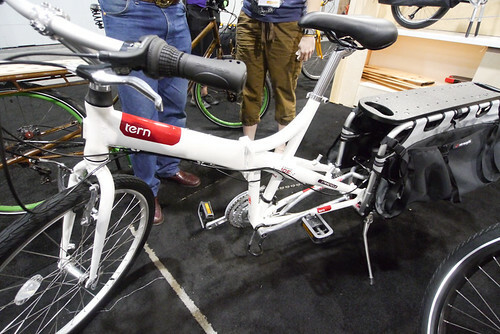 Xtracycle had a few interesting bikes in their booth, including a collaboration with Tern to make a folding longtail and a new Xtracycle bike with a 20inch rear wheel. The smaller wheel helps lower the load as well as adds strength to the wheel. 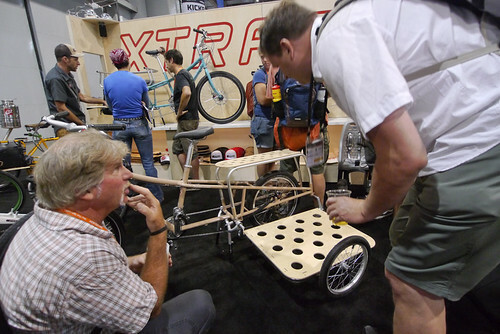 They were also displaying updates to their Free Radicals which were said to be stiffer and stronger as well as Xtracycle sidecar. 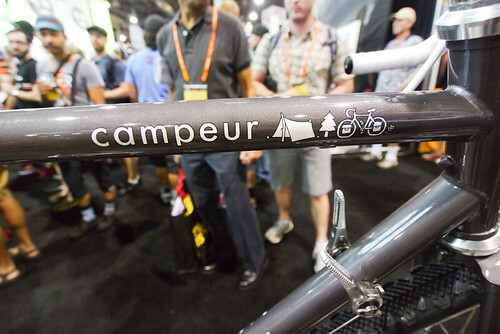 Velo-Orange was showing off their Campeur bike in two configurations. One was a fat tire gravel racer and the other in a more traditional touring setup. The graphic on the toptube was done by Dan Price, whom you may remember from our “Tallest Hobbit We Know” video. Great to see that wonderful connection. There weren’t any jaw dropping accessories this year. 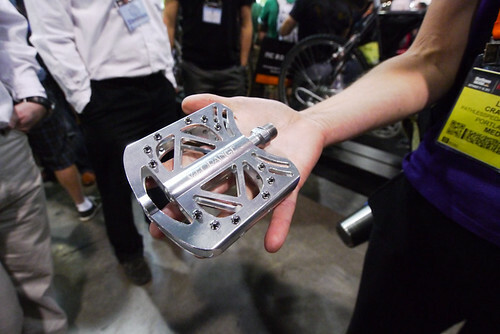 Perhaps the thing that got us most excited was Velo-Orange’s new flat pedal. It’s big, wide and has traction pins and is remarkably lightweight. We are big fans of mountain style flats but they tend to be either ugly, plastic, super heavy or outrageously priced, the new VO pedal should fill in a much needed gap. 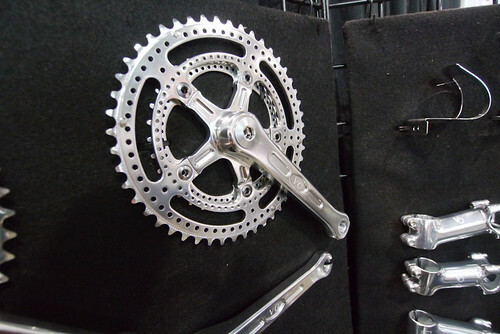 They were also showing some sweet looking drilled out cranks with retro speed holes! Planet Bike’s venerable Super Flash gets some minor upgrades. Most notably a more positive feeling rubber button. 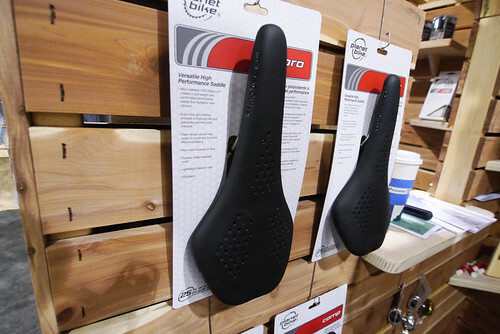 They are also adding some sportier saddles that aren’t as thickly padded with versions with steel and titanium rails. That’s our roundup. We’re hoping to get a chance to try out some of this gear in the next few months to let you know how they actually ride! In Montana last year I met a guy who when he returned home was going to design an under the saddle Revelate / Wildcatgear type harness for Ortleib. Wonder if this has been abandoned or put on back burner? Yikes, those Axiom modular bags made me cringe! I’m not even part of the minimalist touring trend (I consider myself pretty moderate) but those bags are really going to encourage people to over-pack and ruin their touring experience with a 200 lb setup! Also, just making something modular is really going to complicated the “getting ready in the morning” routine & add all that extra unnecessary weight for buckles, zippers, velcro, straps & redundant material. If you ever need a replacement modular piece down the line and Axiom stops making them it is going to be really annoying dealing with that.